Sooty molds are really fungi that grow microscopic threads that become abundant enough to form easily visible black spots. When very abundant, sooty molds cause plants to appear dark and sooty or almost uniformly charcoal gray. Occasionally, sooty molds form a continuous thin sheet that eventually peels away from the plant surface like delicate black tissue paper. Microscopic examination reveals the sooty mold threads may be matted down or more or less cemented together. Capnodiumsooty molds have various kinds of spore forming structures. Honeydew and sooty mold from a tuliptree scale infestation on magnolia. Sooty molds are not plant parasites. 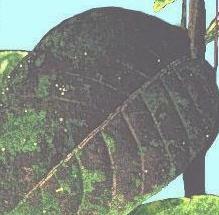 Sooty molds are associated with sucking insect pests (aphids, scales, mealybugs, psyllids) that extract sap from the phloem tissue. Soon after a plant is heavily infested with such a pest, it is usually covered with honeydew. Sucking pests ingest copious amounts of sap to extract nutrients. Much of the water and sugars in the sap pass though the insect are excreted. Unless washed off by rain, the honeydew clings to the plant (and objects below). Spores or fragments of sooty molds are blown are carried to the honeydew and new colonies of sooty mold develop. Sooty molds occur in all parts of North America. Capnodium citri is associated with whiteflies and scale pests on citrus. Capnodium elongatum is associated with scale pests of tuliptree, oleander, osmanthus and other ornamental plants. Other species ofCapnodium are associated with insect pests of fig, crape myrtle, azaleas and many other plants. Scorias spongiosa is associated with aphid and scale pests of alder, pine, beech and other trees. Fumago vagans is associated with sucking pests of linden and other trees, shrubs and even house plants. Sooty molds lessen the aesthetic value of ornamental plants, and lower the vigor of plants by blocking sunlight essential for photosynthesis. The combination of feeding by a large number of aphids or scales and the heavy coating of sooty molds may drastically reduce the vigor and beauty of ornamental plants. Figure 2. Sooty mold on azaleas. The first step in control of sooty molds is to suppress the aphids, scales, or other pests that are excreting the honeydew on which sooty molds subsist. If one of the horticultural oils is used for control, it also has the advantage of helping to loosen sooty molds frorm the plant surface. This hastens the weathering away of the sooty molds. Horticultural oils are formulated by many companies are available through garden centers, hardware stores, and like establishments. Numerous other insecticides are labeled for aphids, scales, mealybugs and other sucking insects. These insects are covered in more detail in the Southeastern US Pest Control Guide for Nursery Crops and Landscape Plantings. Sooty Molds. Laemmlen, F. F. 2011 (revised). How to Manage Pests, Pests in Gardens and Landscapes. 2017 Southeastern US Pest Control Guide for Nursery Crops and Landscape Plantings. Neal, J., J. C. Chong, and J. Williams-Woodard. Southern IPM Center.